Have you ever wanted God to speak directly to you and tell you what you should do? Would you like your children to learn to really talk and walk with God? Part One is designed to help children of all ages to personally understand the high calling that God has for their lives and to learn how to hear God's voice speak to them directly. It simplifies deep truths to be readily assimilated and shows God's love and power to be within easy reach of old and young alike. There are full color diagrams and pictures throughout for easy visual reinforcement and to make explanation simple-aiding those who cannot read yet. 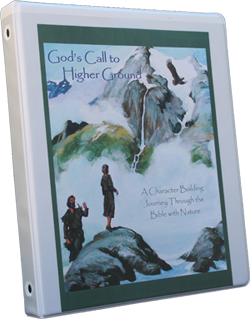 God's Call to Higher Ground is more than a mere book you go through once and you're done. Each part is a building block and is referenced to by the proceeding parts. It is designed to grow, as you and your child add more pages to it-reviewing and going through the concepts over and over again in deeper and deeper ways. Ever been confused about what God's part is in your life and what your part is? Has the Bible ever appeared as words for someone else but you couldn't really see how it applied to you? What is God really like? Would you like your child to really know God and have His Character? The Bible can only be understood fully with the aid of the Holy Spirit; thus, our steps need to be with continual prayer. To understand the directions in the road map God has given us, it is necessary to take the time to learn and acquaint ourselves with the road symbols or language. Part Two is more advanced than Part One, and is designed to help the child grasp research and English skills while embedding more deeply in the mind ways to know and follow God. Although this part is more advanced; it, as all parts of God's Call to Higher Ground, is recommended for all ages and includes many pictures for those who cannot read yet. It may surprise many to find that even the very young can grasp a basic understanding far greater than is generally expected of them. Both Part One and Part Two are building blocks to form a foundation on which we will build both our Bible studies and our nature studies as future lessons are added. 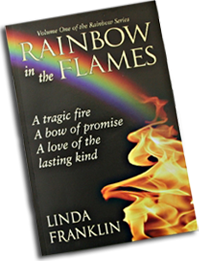 Rainbow in the Flames is a true story of how beauty came from ashes. Not only a touching survival story of young Jed Franklin's courageous uphill battle, physically and emotionally, from a severe burn injury, but it also includes the struggle of his parents to relate to their life-altering reality. Laugh and cry with the Franklin family as they take their first steps toward healing. S.A.N.C.T.U.A.R.Y. Selections is unique primarily because of the introduction. More than thirty pages are devoted to presenting material from health seminars. It is a guide to healthful living, both physically and spiritually. 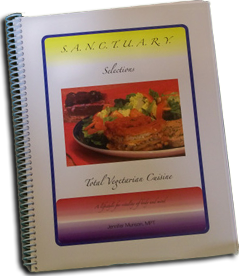 The total vegetarian diet this cookbook advocates has been proven by various studies to prevent cancer, diabetes and other diseases. All information is based on science, the Bible and inspired writings. The recipes in this book were created with health and taste in mind, and are proven favorites in the Munson family of five. There are full color pictures at the beginning of each section. It also features a glossary, topical index and an alphabetical index.